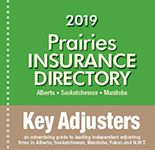 Key Adjusters | Insurance People Media Ltd.
Key Adjusters is a regional guide to leading independent adjusting offices in Western Canada: British Columbia, Alberta, Saskatchewan, Manitoba, Yukon and Northwest Territories. 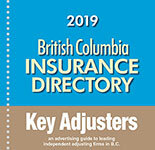 Contains comprehensive listings of these adjusters appearing in the current editions of the British Columbia Insurance Directory and the Prairies Insurance Directory. To have your firm shown here, please contact Susan Mellor at 604-874-1001 or 1-800-888-8811.